If you’ve had your wallet for the last 5 years, it’s probably time to get a new one. Money doesn’t grow on trees and you would hate to lose your dollar bills to a faulty wallet! We’ve collected the best bifold wallets in one list to give you 10 options to choose from. No longer worry about leaving a money trail behind you. Grab a new bifold wallet to keep it safe and sound! So you know you need a new wallet, but how can you decide which bifold wallet is best for you? We’ve hand-selected a few wallet features to give you a good idea of what you should look for when you’re ready to buy a new one. Take a look at these features before adding a new wallet to your cart! Material: There are several different kinds of materials wallets are made out of these days. The most common material is leather. Some are cow leather, while others are made of horse leather. You can even find synthetic leather wallets. Size: There are several reasons why size matters when it comes to your new wallet. If you want more credit card storage or a large cash compartment, you may be sacrificing the compactness of your wallet. If you want a compact wallet, look for a smaller size! Color: One of the biggest characteristics that many base their wallet purchases on is color. Some brands offer bright colors, but most wallets come in neutral colors like black, brown, and tan. The same wallet colors are offered across the board. Money Clip: A money clip is perfect for you if you carry a lot of cash with you at one time. Money clips allow you to easily access your dollar bills while securing them to your wallet so you’ll never worry about losing your money! ID Window: ID windows are perfect for you if you struggle to get your ID out when you need it. ID windows allow you to show your personal information without removing the card from your wallet itself. RFID Blocking: RFID blocking keeps your personal ID and credit card information safe from being stolen by swipers or passerby who are looking to steal it. Wallets with RFID blocking prevent you from having your identity stolen and who doesn’t want that? Now that you know how to pick out the best bifold wallet for you, it’s time to get into the top 10 wallets on our list! The top pick and budget pick wallets are the best picks on our list. We also included 8 other options for you to choose from to give you a variety of styles, materials, and sizes. If you’re ready to grab yourself a new wallet, it’s time to dive into our list! The Distil Union Bifold Wallet is our top pick because it has almost every characteristic that you should look for. Designed to hold all of your essential cards and cash, this slim wallet fits perfectly in your pants pocket without leaving anything behind. With a money clip to secure your cash and RFID blocking capabilities to keep your cards secure, this wallet has all the perks you want. The FlexLock patent-pending pockets give you peace of mind that your cards will never fall out, too. Made from real leather, this thin bifold wallet looks great and is durable enough to last for years to come. Even with its RFID blocking capabilities, you can still use any access keys or entry cards without having to pull them out of your wallet. No longer worry about losing your cards or cash or finding kitschy ways to protect your information, the Distil Union Bifold Wallet has everything you need to keep everything secure in a slim design. For our budget pick, we selected the SERMAN BRANDS Bifold Wallet because it gives you everything you need for the best value. With 8 colors to choose from, including all your favorite neutral colors, this wallet will never go out of style. 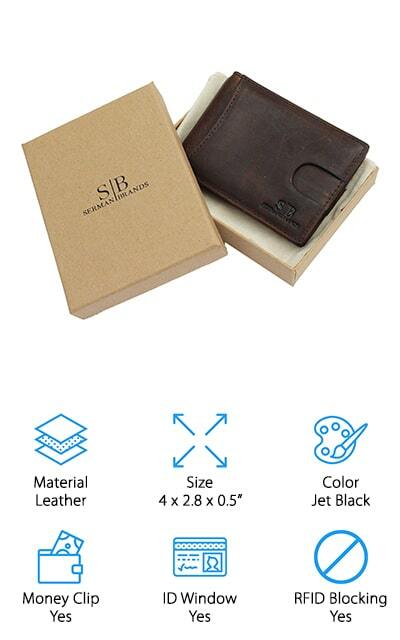 With RFID protection and a money clip, all of your information and tangible items are secure. The ID window allows you to use your ID easily without removing it from the wallet when you’re out on the town. In the front pocket, you can easily take out your most used card over and over without having to open up your wallet once. The smart pull-up strap also comes in handy when you need to take out other cards from inside your wallet. 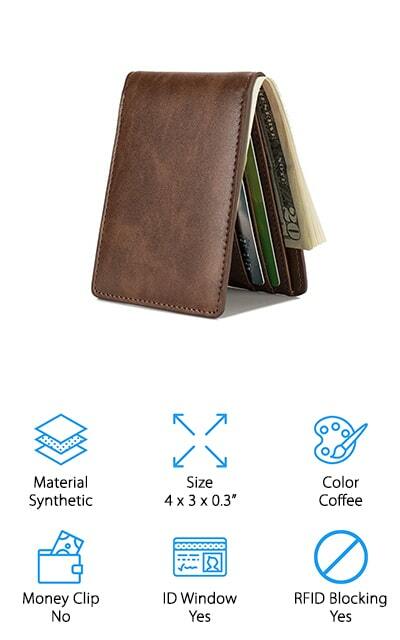 SERMAN BRANDS designed this wallet to reduce the bulk of so many cards to keep from weighing your pockets down. The SERMAN BRANDS Bifold Wallet is the best cheap bifold wallet that has everything you need to keep your information protected and your cards secure. 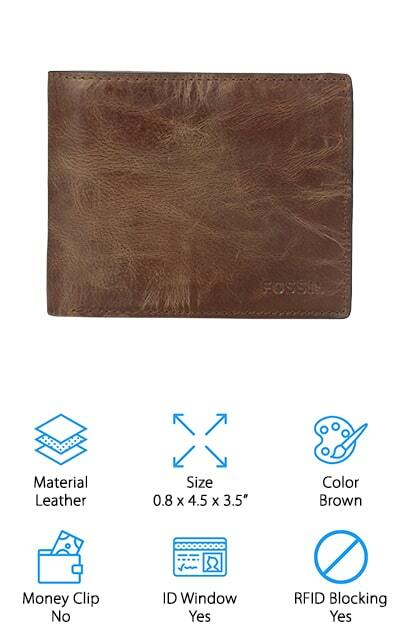 Fossil is known for having the best men’s bifold wallet over the last few years as they serve you with high quality and stylish wallets that are easy to carry every day. With 27 designs and colors to choose from, Fossil gives you the most option to pair your wallet with your other accessories and clothing. Inside this wallet, you’ll find 8 credit card pockets and two ID windows to store your IDs conveniently if you need to show it at restaurants without taking it in and out. There’s also a cash pocket to store away your cash without bending it, too. The Fossil Flip Bifold Wallet is more of a traditional wallet compared to the other wallets we’ve listed above, but it allows you to have a classic look and style without compromising on the features you need. If you’re interested in a true leather bifold wallet, this one is perfect for you! 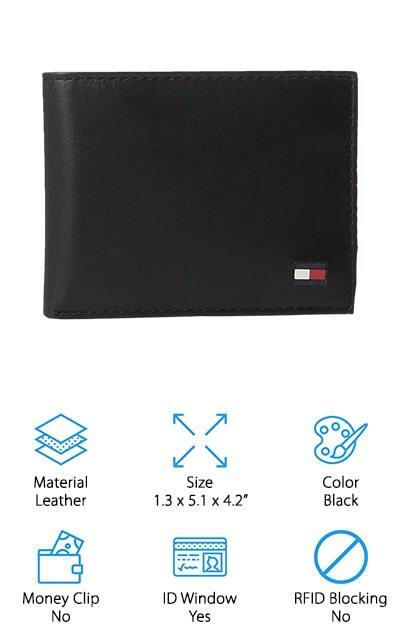 Tommy Hilfiger thought of everything with this wallet. 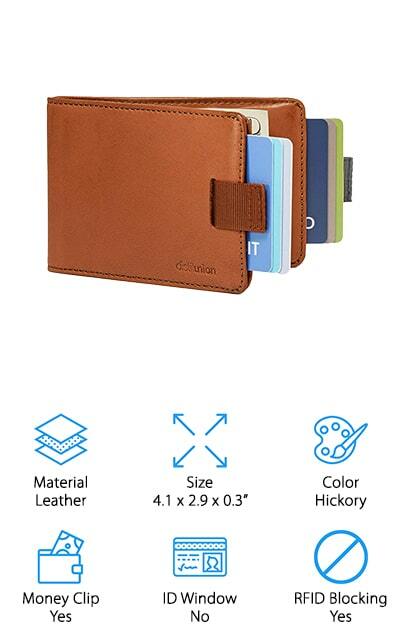 Made from genuine leather, this wallet is durable and filled to the brim with card storage. With 4 inner card pockets, 2 hidden pockets, a dollar bill compartment, an ID window, and a removable card holder, you have endless storage options. The removable card holder is perfect for carrying several essential cards when you want to lighten your load when traveling or heading to an event where you want to keep your wallet discreet. Although this wallet doesn’t come with a money clip or RFID blocking capabilities, you’ll be able to carry your cards and cash securely without worrying about them falling out. The option to remove a few cards and still have another wallet is also a great plus. If you’re not concerned with those features, you’ll be happy you bought a Tommy Hilfiger Wallet to make your everyday transactions easier. Polare Men’s Slim Bifold Wallet gives you two sizes of wallets to choose from without a huge price difference. Despite being made with Italian cowhide leather, this wallet won’t break the bank either. With RFID technology, you’re able to prevent scanners and swipers from stealing the information from your credit cards and driver’s license. You’ll find 6 card slots and 2 bill compartments to give you ample storage for all the essentials. The wallets are handcrafted by professionals artisans to give you tough stitching that will last for years to come, every time. If you’re not satisfied with your wallet or experience breakage, Polare guarantees your money back for one year from the purchase date. These wallets are made in the USA and come with a gift box if you choose to gift one to a friend or family member. If you’re interested in finding the best leather bifold wallet, you’ve stumbled upon one of the finest. The HISSIMO Front Pocket Wallet is another traditional wallet with over 15 color options to choose from. Made from synthetic leather, you get all the qualities of real leather with an eco-friendly twist. Synthetic leather is also considered to be more durable than some leathers, too. This wallet was designed with minimalists in mind as it only has a 3 card slots, a cash compartment, and one ID window. RFID blocking capabilities are also included with this wallet to prevent you from being the victim of a data crime. If you experience any kind of issues with this wallet in the first 18 months, you’re covered by HISSIMO’s warranty to ensure you have a wallet that works at all times. If you’re looking for a simple design this wallet has everything you need for you if you only carry the bare essentials. For the best men’s slim bifold wallet at a great price, the HISSIMO Front Pocket Wallet is your best bet. Timberland is known for their high-quality leather boots, but have you ever thought about a Timberland wallet? Timberland’s Blix Slimfold Wallet is the perfect size for people looking for decent credit card storage with a durable external casing. Included in this wallet are 3 credit card pockets, 2 slip pockets, one ID window, and a large bill pocket. You’ll never worry about your wallet falling apart as Timberland prides themselves on their tight stitching and high quality, genuine leather. The best part about this wallet is that it gives you the option to put it in both your front and back pant pockets due to its slim design. 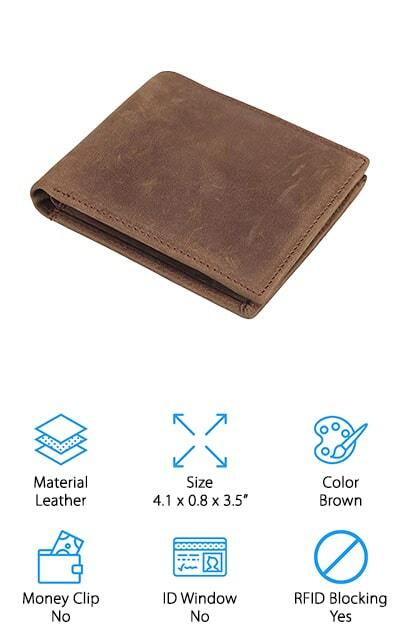 With rich neutral colors, you can have a wallet in black, dark brown, brown, navy, or tan. There’s no longer a reason to choose between style and size, the Timberland Blix Slimfold Wallet has everything you need to bring your most essential cards and cash no matter what kind of pants you wear! Alpine Swiss is known for their durable products and goods and their wallets are no different. The Alpine Swiss Bifold Wallet comes in 8 colors including neutrals and bright colors. Despite its slim design, you’ll find 7 credit card slots, 2 ID windows, and 2 oversized receipt compartments. 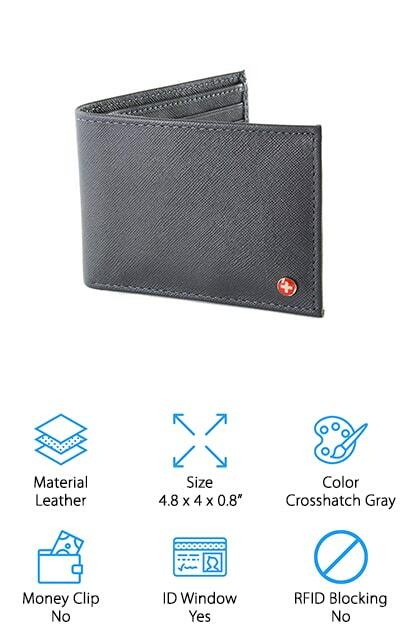 This wallet also comes with a removable mini wallet that includes one ID window and a few credit card slots to allow you to scale down even more if needed. You can feel good about purchasing a wallet from Alpine Swiss because they donate 2,500 meals every year to families in need all over the world and every purchase you make helps. With several color options and a gift box, you’ll be able to pick the best gift for the friend or family member who has a wallet that’s on its last legs. If you want a genuine leather wallet with great storage, the Alpine Swiss Bifold Wallet is a great option. For a uniquely designed wallet, the SimpacX Ultimate Slim Wallet has exactly what you need. 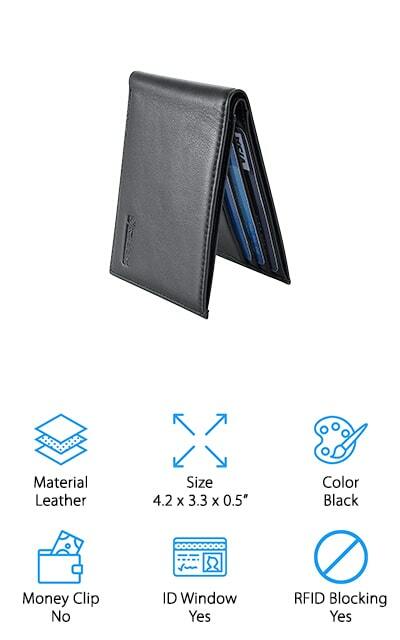 This fold-over bifold wallet comes in your standard smooth leather design, but you also have the option to have a checkerboard type design in several colors, too. This wallet is made for the minimalist men out there who don’t need more than 3 credit cards, 1 ID, and a big compartment for cash. This leather comes from horses and is durable enough to last you for years. Even though it’s extremely durable, it’s also soft and bendable to fit perfectly ins your pockets without bothering you as you walk. With RFID technology, you won’t have to worry about having your information swiped anytime you find yourself at the register. If you have any issues with your SimpacX wallet, you have a guaranteed hassle-free return or exchange, too. For a great wallet at an even better price, the SimpacX Ultimate Slim Wallet is exactly what you need. The NapaWalli Bifold Slim Wallet is the last wallet on our list, but that doesn’t mean it lacks the features you need! Made from genuine leather, you have the durability and style of a traditional wallet, but you also have extra features, too. This wallet offers you RFID blocking, an ID window for easy ID access, and a money clip. You’ll also have pull-strap access to your cards to make it easier for you to remove the cards you use on a regular basis. The front pocket is another great feature that allows you to stow away your most used card in the most convenient place. With a 1 year warranty, you won’t ever have to be without a wallet if you receive one that’s defected upon arrival. NapaWalli’s no bulk, minimalist design you have all the storage you need at an affordable price. 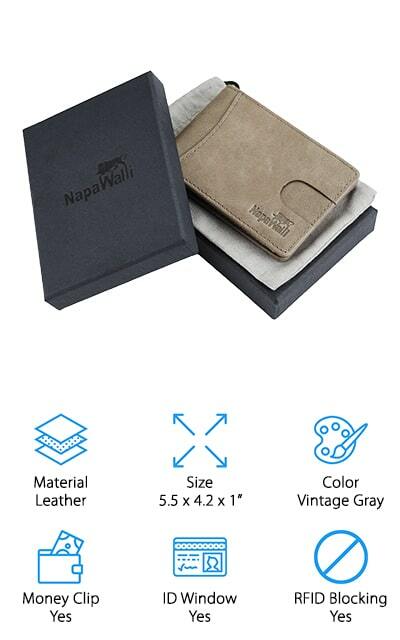 For a wallet that meets your everyday needs, look no further than the NapaWalli Bifold Slim Wallet!